The domain within your query sequence starts at position 700 and ends at position 734; the E-value for the ANATO domain shown below is 3.58e-12. 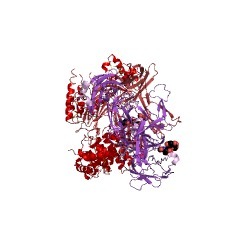 C3a, C4a and C5a anaphylatoxins are protein fragments generated enzymatically in serum during activation of complement molecules C3, C4, and C5. They induce smooth muscle contraction. 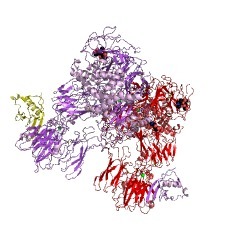 These fragments are homologous to a three-fold repeat in fibulins. 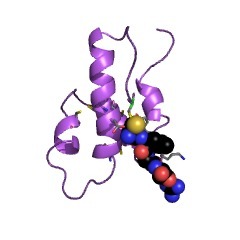 This entry represents C3a, C4a and C5a anaphylatoxins, which are protein fragments generated enzymatically in serum during activation of complement molecules C3, C4, and C5. They induce smooth muscle contraction. 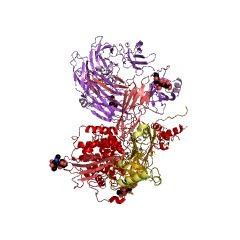 These fragments are homologous to a three-fold repeat in fibulins. 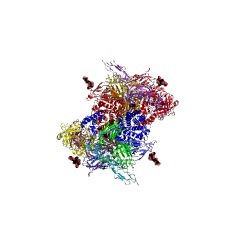 Complement components C3, C4 and C5 are large glycoproteins that have important functions in the immune response and host defence [(PUBMED:1431125)]. They have a wide variety of biological activities and are proteolytically activated by cleavage at a specific site, forming a- and b-fragments [(PUBMED:2777798)]. 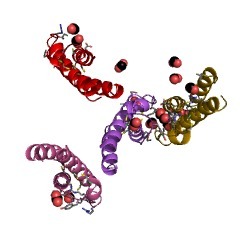 A-fragments form distinct structural domains of approximately 76 amino acids, coded for by a single exon within the complement protein gene. The C3a, C4a and C5a components are referred to as anaphylatoxins [(PUBMED:2777798), (PUBMED:3081348)]: they cause smooth muscle contraction, histamine release from mast cells, and enhanced vascular permeability [(PUBMED:3081348)]. They also mediate chemotaxis, inflammation, and generation of cytotoxic oxygen radicals [(PUBMED:3081348)]. 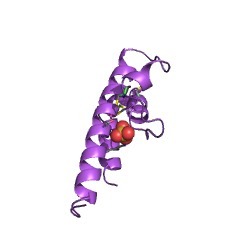 The proteins are highly hydrophilic, with a mainly alpha-helical structure held together by 3 disulphide bridges [(PUBMED:3081348)]. Fibulins are secreted glycoproteins that become incorporated into a fibrillar extracellular matrix when expressed by cultured cells or added exogenously to cell monolayers [(PUBMED:2269669), (PUBMED:12778127)]. The five known members of the family share an elongated structure and many calcium-binding sites, owing to the presence of tandem arrays of epidermal growth factor-like domains. 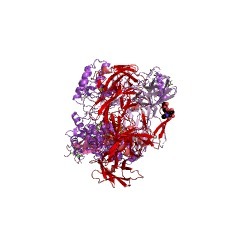 They have overlapping binding sites for several basement-membrane proteins, tropoelastin, fibrillin, fibronectin and proteoglycans, and they participate in diverse supramolecular structures. 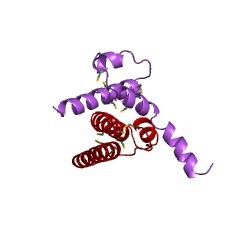 The amino-terminal domain I of fibulin consists of three anaphylatoxin-like (AT) modules, each approximately 40 residues long and containing four or six cysteines. 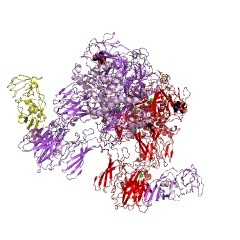 The structure of an AT module was determined for the complement-derived anaphylatoxin C3a, and was found to be a compact alpha-helical fold that is stabilised by three disulphide bridges in the pattern Cys1-4, Cys2-5 and Cys3-6 (where Cys is cysteine). 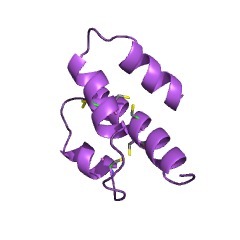 The bulk of the remaining portion of the fibulin molecule is a series of nine EGF-like repeats [(PUBMED:8245130)]. 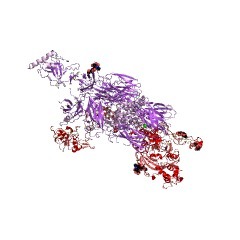 There are 4026 ANATO domains in 2261 proteins in SMART's nrdb database. Taxonomic distribution of proteins containing ANATO domain. This tree includes only several representative species. The complete taxonomic breakdown of all proteins with ANATO domain is also avaliable. Click on the protein counts, or double click on taxonomic names to display all proteins containing ANATO domain in the selected taxonomic class. 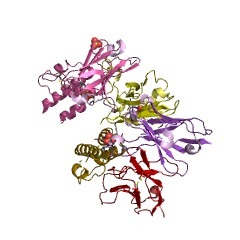 Structure and expression of fibulin-2, a novel extracellular matrix protein with multiple EGF-like repeats and consensus motifs for calcium binding. 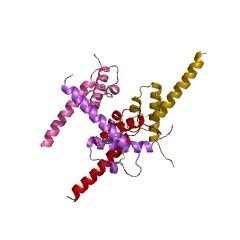 A new protein, fibulin-2, was predicted from sequence analysis of cDNA clones obtained from a mouse fibroblast library. 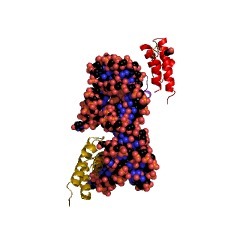 This protein consists of a 1195-residue polypeptide preceded by a 26-residue signal peptide. 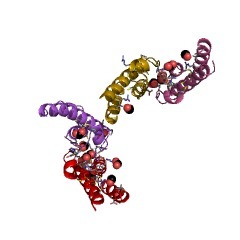 The COOH-terminal region of 787 amino acids contained three anaphylatoxin-related segments (domain I), 11 EGF-like repeats (domain II), 10 of which had a consensus motif for calcium-binding, and a 115-residue globular domain III. 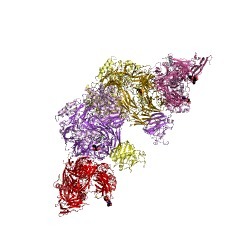 Except for two additional EGF-like repeats, this COOH-terminal region showed 43% sequence identity with the previously described fibulin-1 (BM-90). 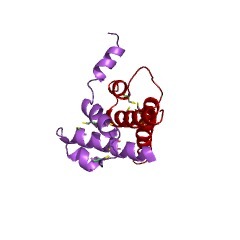 The NH2-terminal 408 residues, unique to fibulin-2, showed no sequence homology to other known proteins and presumably form two additional domains that differ in their cysteine content. 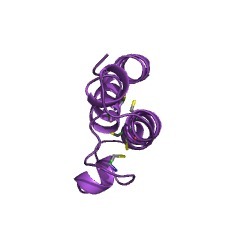 Recombinant fibulin-2 was produced and secreted by human cell clones as a disulfide-bonded trimer. 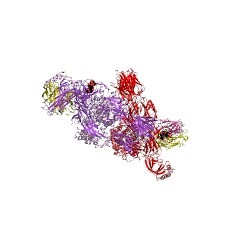 Rotary shadowing visualized the protein as three 40-45 nm long rods which are connected at one end in a globe-like structure. No significant immunological cross-reaction could be detected between fibulin-1 and fibulin-2. Production of the fibulin-2 was demonstrated by Northern blots and radioimmunoassay in fibroblasts but not in several tumor cell lines. Together with the observation that the serum level of fibulin-2 is 1,000-fold lower than that of fibulin-1, the data indicate that these two isoforms are not always coordinately expressed. This is also suggested by Northern blots of tissue mRNAs and by immunofluorescence localizations using mouse tissues. The latter studies also demonstrated an extracellular localization for fibulin-2 in basement membranes and other connective tissue compartments. 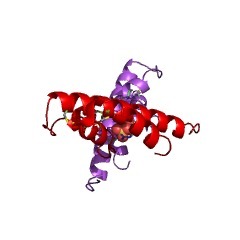 Structure and function of C3a anaphylatoxin. 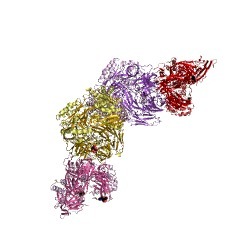 Tertiary structure of human complement component C5a in solution from nuclear magnetic resonance data. 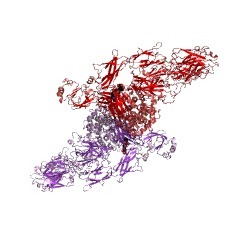 The tertiary structure for the region 1-63 of the 74 amino acid human complement protein C5a in solution was calculated from a large number of distance constraints derived from nuclear Overhauser effects with an angular distance geometry algorithm. 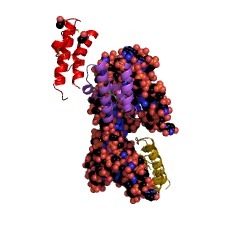 The protein consists of four helices juxtaposed in an approximately antiparallel topology connected by peptide loops located at the surface of the molecule. The structures obtained for the helices are compatible with alpha-helical hydrogen-bonding patterns, which provides an explanation for the observed slow solvent exchange kinetics of the amide protons in these peptide regions. 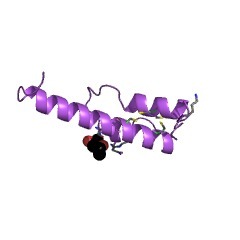 In contrast to the peptide region 1-63, no defined structure could be assigned to the C-terminal region 64-74, which increasingly acquires dynamic random coil characteristics as the end of the peptide chain is approached. An average root-mean-square deviation of 1.6 A was obtained for the alpha-carbons of the first 63 residues in the calculated ensemble of C5a structures, while the alpha-helices were determined with an average root-mean-square deviation of 0.8 A for the alpha-carbons. 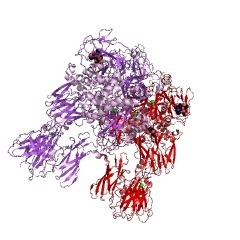 A comparison between the solution structure of C5a and the crystal structure of the functionally related C3a protein, as well as inferences for the interaction of C5a with its receptor on polymorphonuclear leukocytes, is discussed. SwissProt sequences and OMIM curated human diseases associated with missense mutations within the ANATO domain. This information is based on mapping of SMART genomic protein database to KEGG orthologous groups. Percentage points are related to the number of proteins with ANATO domain which could be assigned to a KEGG orthologous group, and not all proteins containing ANATO domain. Please note that proteins can be included in multiple pathways, ie. the numbers above will not always add up to 100%.